Planting Blueberry Bushes - How To Grow Delicious Blueberries! When it comes to growing a steady supply of delicious fresh fruit, its hard to beat the harvesting rewards that come from planting blueberry bushes. Blueberries are one of the healthiest fruits around. The low calorie, high-nutrient fruit is loaded with all kinds of goodness, including powerful antioxidants. Blueberries are a nutrient-filled powerhouse of goodness. And beyond their nutritional power, they taste great! Especially when grown and harvested from your own backyard. Blueberry bushes can provide a steady crop of fruit for 20 years or more. And for backyard gardeners with little space for fruit trees, they are an excellent way to grow fruit. 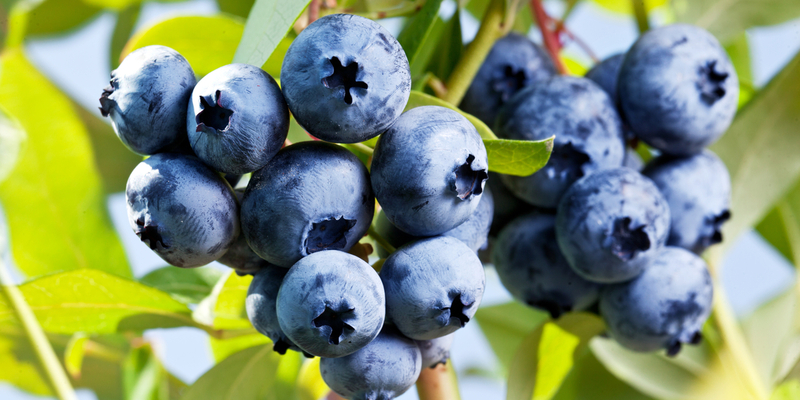 Here are a few top tips to keep in mind when growing your own delicious crop of blueberries. Growing blueberries successfully all starts with selecting the best variety for your area. There are three main types of blueberry bushes to choose from. Highbush, lowbush, and half-high, which is a mixture of the two. The highbush is the most commonly grown type of blueberry bush. Of the three, Highbush is by far the most commonly grown. It is grown successfully in zones 4 through 8, depending on the variety chosen. The lowbush blueberry bushes thrive well in cooler climates. They draw their roots from wild blueberries. As their name suggests, they grow much lower to the ground. The half-high variety, a blend of the first two, are medium sized bushes. The half-high tolerates temperatures to the low 30’s. Blueberries grow well in soil that is slightly acidic. They are best planted in the spring before summer’s heat has set in. When planting blueberry bushes, firm the soil around the plants before mulching. Start by digging planting holes to twice the size of the planting container. Next, mix in generous amounts of compost. It is also a great idea to add in pine needles or pine bark chips to the planting hole. As it breaks down, the pine needles /pine bark helps to add a bit of acid to the plant’s roots. Before covering with soil, flood the planting hole with water to soak the roots. Finally, finish by mulching with a two to three inch layer of pine needles, pine bark, or hardwood mulch. pine needles are an excellent mulch for blueberry bushes. Mulching not only keeps out competing weeds, it also helps release additional acid into the soil over time. Water weekly for the first year after planting until plants have become fully established. If you are looking for a few great varieties to try, Jersey Blueberry High Bushes and Legacy Northern Highbush are both excellent choices. Blueberry bushes should be pruned in late winter. For most climates, January or February is the ideal time. It is important for the bushes to be dormant for the pruning process. Trim out any damaged or diseased wood, and remove any branches touching the ground. Blueberry bushes should be fertilized in late summer after they have finished fruiting. This will help promote new growth for the following year’s crop. Fertilize by working in generous amount of compost to the soil, or with a basic 10-10-10 fertilizer. Unfortunately, birds love blueberries as much as we do. They can wipe out a crop quickly if the bushes are not properly protected. When fruit set begins, protect bushes with bird netting. Cover early, as birds and wildlife will eat the fruit well before it ripens.